An initial appointment is scheduled to discuss your project and assess the site. 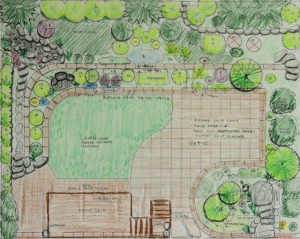 By integrating your dreams with site features, we create a functional master plan including overall layout, hardscapes, water features, retaining walls, paths, decks, patios, lighting, outdoor living spaces, fire pits, edible gardens, native plant areas, plantings and garden art . The plan will include installation guidelines and how-to information. I will review a conceptual preliminary plan with you and fine tune it to meet your vision. The final plan will be drawn to scale and can be installed by a contractor or by you. We offer guidance in phasing in aspects of the master plan over time. In a two-hour (minimum) site visit, we focus on a particular area of the yard, making specific suggestions for enhancing that area. You will be given either written notes or a quick sketch of the area. The session can be expanded on a per-hour basis. Need some “ how-to” guidance? By encouraging sustainable practices, I empower you to become a steward of your land and have fun doing so. No space is too small for the presence of plants. We design and install containers for decks, patios, and entries that have year-round interest and color. Grow edibles right outside the kitchen door that are nutritious and decorative by planting in containers and using plants with interesting foliage. With a background in field supervision, we are experienced in working closely with your installer to ensure that the intent of the design and your vision are carried out. With on-site designer involvement, any site adjustments can be carried out in an optimal manner. Pam is available to teach classes on a variety of landscape topics, is a published garden writer and garden photographer. Please contact Planscapes to schedule speaking engagements, classes or for photography session. 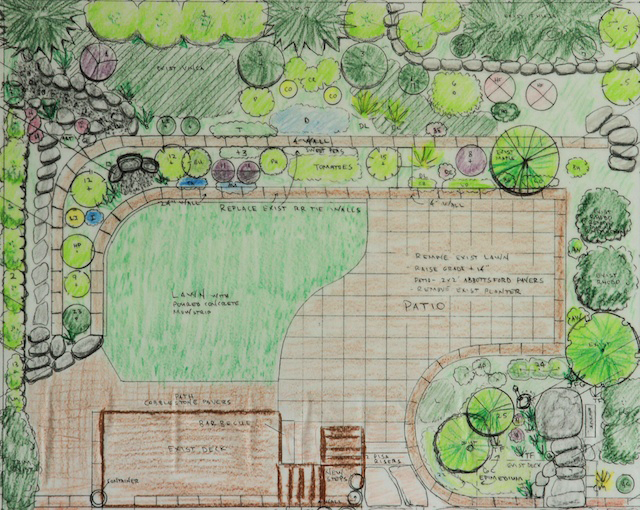 We incorporate Feng Shui principles to create gardens of harmony and balance.